^^ Nifty headline, right? I thought so anyway. 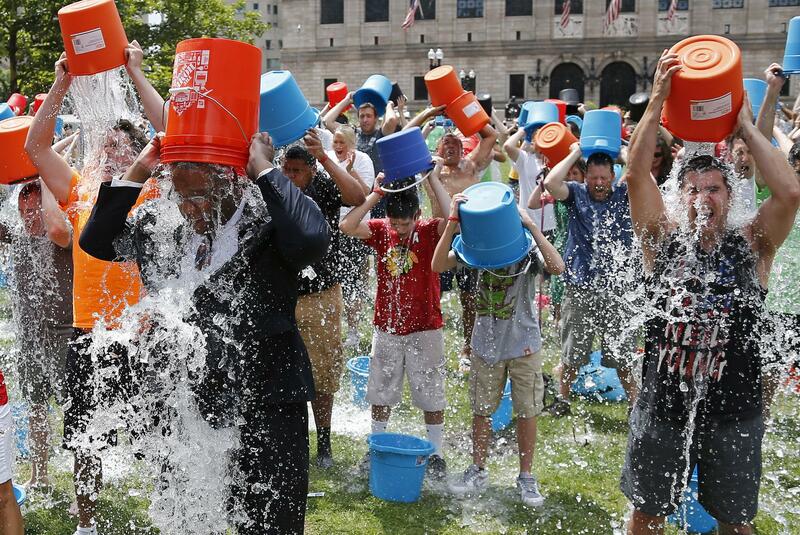 And maybe it would have served the American Family Association well to use it on a recent release urging people to think twice before donating to the Amyotrophic Lateral Sclerosis Association as part of the popular Ice Bucket Challenge. I guess it has its own charm. AFA is firmly on the religious right, boycotting companies that promote products to the LGBT community and choose the term “Happy Holidays” over “Merry Christmas.” But this particular message seemed to bother even supporters of the group – not because of its position, but because of the manner in which it was communicated. I’ve been meaning to blog about the shift in headline writing to SEO and viral social sharing. For now, let me just direct you to a feature in the Columbia Journalism Review, though you probably don’t need to click to know exactly what I’m talking about. “ALS challenge kills babies” is about as tabloid-esque as it gets… the good old-fashioned form of clickbait. The actual argument of the AFA and similar groups is that the ALSA’s use of embryonic stem cells for research violates the sanctity of life. This is not a blog post to debate the merits of that argument. Instead, it’s one to think about why even those who agree with that argument cringed at the way it was presented. In other words, supporters of the cause were concerned with the credibility of the source. We make snap judgments when it comes to these sorts of things – give us a reason to be skeptical, and we will. But we’ll also click. And therein lies the rub – advocacy groups want credibility, but they also want eyeballs. The shocking headline worked, at least in the sense that the article has been widely shared on social media (which is how I came across it), but did it persuade anyone to change their attitudes or behaviors? Not so far as I can tell, at least judging from friends in the same social network who continue to pour ice water on their heads (and hopefully donate money to a worthy cause). There’s another element to this – advocacy against something that’s generally seen as benevolent. The Internet can hate on anything, but I find it awful hard to be cynical about the ALSA campaign. Sure, it fills up my Facebook news feed, and there are probably some people who are skirting the donation aspect of the challenge. Still, it’s hard to deny the increase in awareness and influx in research dollars are great things, and they’re being accomplished in a way that people are enjoying. So, when you’re going to attack an element of something that is popular – create division in something that has been uniting – you better do it with some tact. Why was the call to action simply to abandon a charitable cause? Concerned audiences could have easily been pointed in the direction of ALS research organizations that don’t use embryonic stem cells. The Ice Bucket Challenge kills babies? I’ll bet the Evangelical who already completed the challenge and wrote a check to do some good feels great about now. Because ALS doesn’t kill enough people, we shouldn’t fund research for cure? Think of the thirsty? I tried to find who these “others” making these claims might be. For the clean water angle, I found this on the Huffington Post by a blogger who writes a great deal about (and as) her cats. They were joined by the guy who plays Spock on the new Star Trek movies a few days later. The death rate argument? That one seemed to belong to the author; I couldn’t find anyone making a similar claim… and probably for good reason. It’s like a straw man in reverse. Instead of making up weak arguments to knock down, AFA counted them as allies. And for what purpose? For a reader already miffed by the headline, even the casual mention of these “other” objections only serves to further distract from the heart of the plea. Consider this article from anti-abortion group LifeNews, posted two days after the AFA piece. Also brief, it explains what ALS is and defends it as a worthy cause before addressing concerns about embryonic stem cell research. What is the article driving toward? They state it in bold, with an exclamation point for good measure: But there are alternatives for donations that use only ethical stem cell sources! Four charities are not just listed, but described, with the author even disclosing a conflict of interest for being an adviser to one of them. The headline reads, “Send your Ice Bucket Challenge donation to ethical, successful adult stem cell research.” Absent organizational clout and aggressive headline tactics, this more focused and even-handed persuasion attempt had been shared 227 times on Facebook as of this writing. The AFA post had been shared over 7,000 times. What can be learned from all of this? Something, I hope, lest I write 1,000 words about a 500-word release for nothing. First, clickbait headlines aren’t always worth the credibility hit that’s coming to the message itself, especially when that message is something serious. Second, stacking the deck with weaker, tangential arguments actually hurts the credibility of a more carefully crafted main point. Third, offering alternative solutions trumps outright condemnation. Finally, all of this becomes infinitely more important when attempting to reach an audience that either (a) is inclined to disagree, or (b) has an affinity toward the target of criticism. All of that from filmed philanthropic cold showers. Internet, you win again.